Have you ever noticed how some plants seem to bend as they grow. I know anytime we start tomatoes inside they always end up bending toward the window instead of growing straight up. Turns out they are growing towards the light. I think we all know this, but proving it required a bit of work and a science experiment. 1. 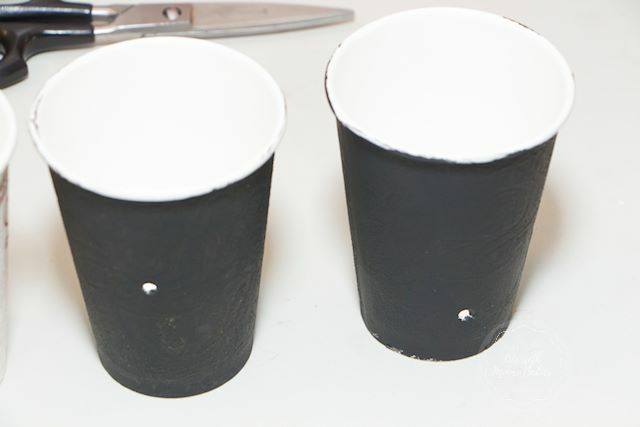 Paint 2 of the cups black. You can paint the third black if you like; it won't affect the experiment either way. 2. 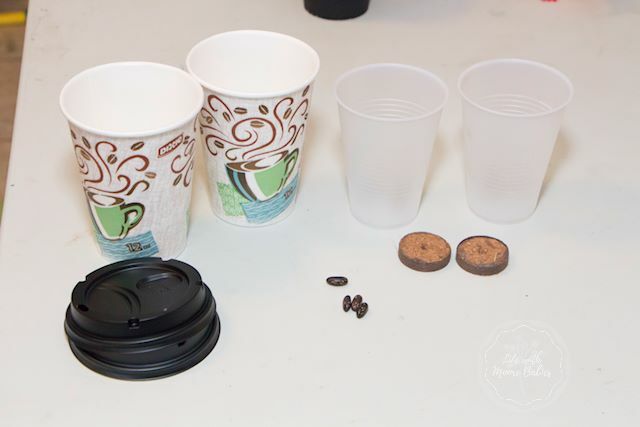 Cover the holes in the lids with black tape. If you are like me and can't find the black tape that you know you bought, just cut some black construction paper and tape it over the holes. 3. Now you need to expand those little seed pellets. Ideally, you would use the kind with the netting around them, so they are contained, but our local store did not have a lot of their gardening supplies out yet, so we had to do without. We used the kind without the netting and placed them in cut-off clear plastic cups. 4. Once the peat pellets have expanded plant a bean seed in each. 5. 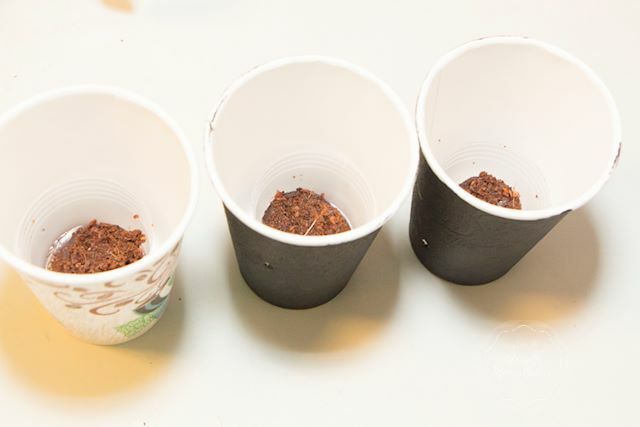 Place one peat pellet in each cup. Your control cup is ready; now to finish the other two cups. 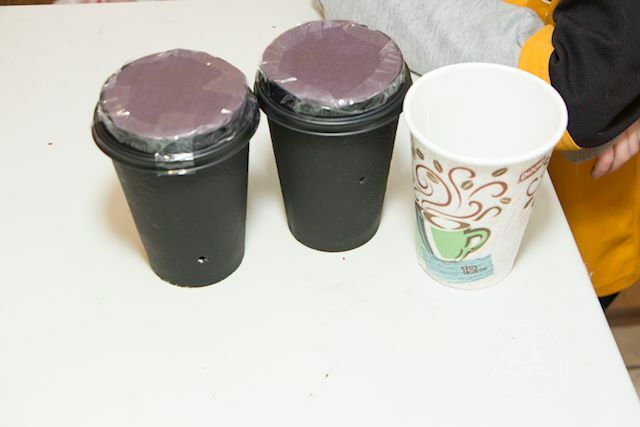 The two cups you painted black also need their lids put on securely. 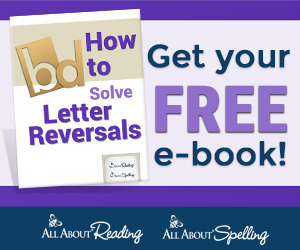 You don't want any extra light coming in the cup. 6. 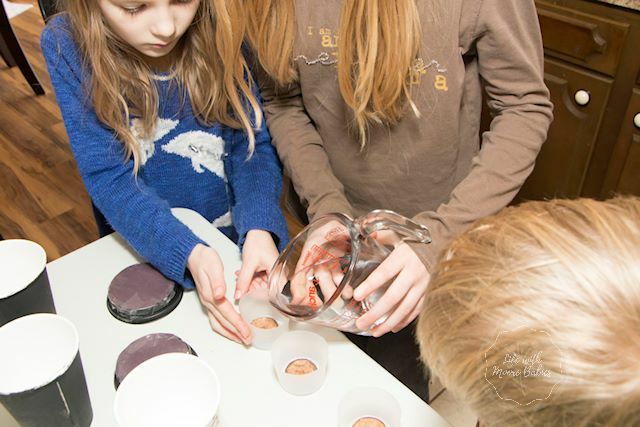 Using a sharp pencil, poke a hole near the bottom of one experimental cups. Low enough that you know it is below the top of the dirt. In the other place a hole midway up the cup. You want these holes to be the only source of light getting into the cup. 7. Place your cups in a sunny window and wait. Now that your cups are ready you just have to wait, watch, and water! Obviously, this experiment will take a couple weeks to get results. In the meantime you will have to water the plants which is a little tricky since you don't want light to get in. 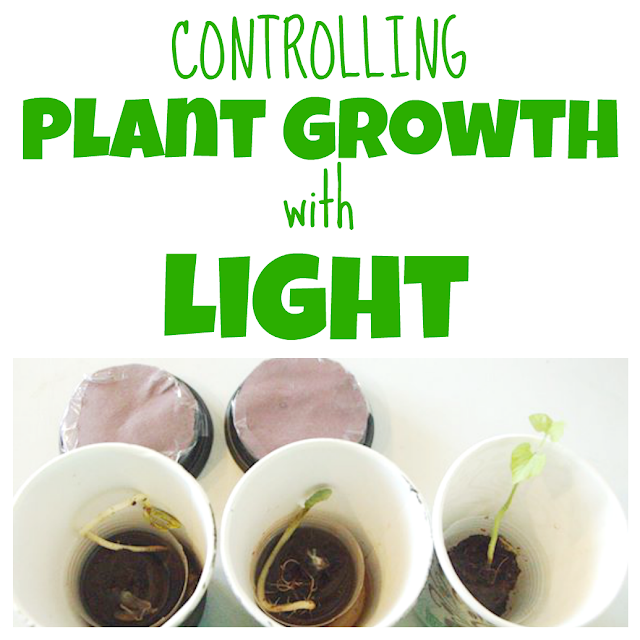 So, every three days you will want to take your cups to the bathroom and using the smallest light you can (I used my cellphone), remove the lids and water the plants. Remember you don't want to expose the experimental plants to much light, so be quick! In a few days you will likely notice initial growth. You want to continue the experiment complete with careful watering for at least 2 weeks. We actually kept ours for about 4 weeks. We finally decided to stop based on how large our control plant was. 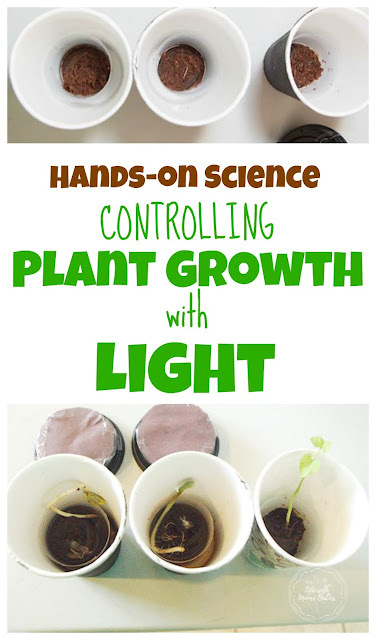 When we finally got to look at our plants in the light the results were not too surprising. The plants grew towards the light source. If you look at the control plant you see it grew straight up like a normal plant. The two experimental plants grew towards the little holes that acted as a light source for them. You also notice the plants in the cups with lids are very pale in color. 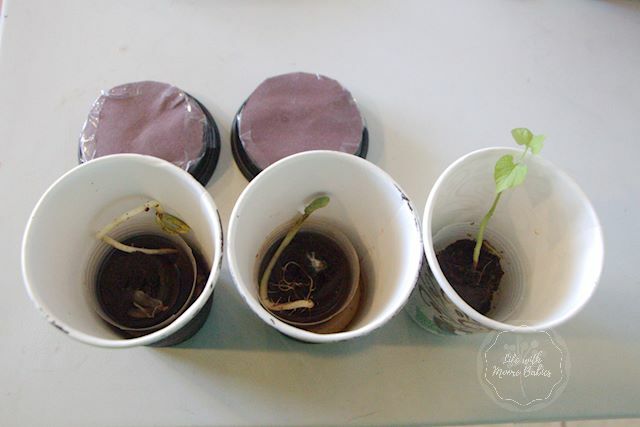 As we learned in our Seed Germination Experiment, this is because they have not been exposed to enough light to cause them to form chlorophyll (the substance that gives plants a green color). Plants need light to live, and they will grow in the direction of the light. In my mind I always seemed to picture the more bent part of a plant as the side doing the work to get to the light, but it is in fact the opposite side that is working harder. This happens because the side of the stem that is in the dark is actually growing faster than the side in the light causing the stem to bend over toward the light. Pretty amazing how a plant can find the light even if it is a tiny dot! 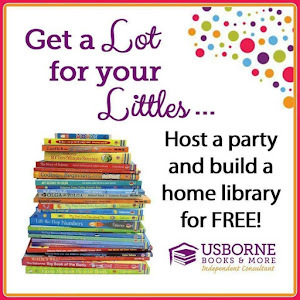 Get more great Kids Botany Activities by following our Pinterest Botany Board!